Poison Ivory is the fifteenth mystery in the Den of Antiquity series featuring amateur sleuth, antiques dealer and heroine Abigail Timberlake-Washburn. When she purchases (not "buys", because proper southern ladies don't buy) an antique rosewood linen chest for her mother, Abigail is arrested on suspicion of trafficking illegal ivory. After her ex-husband Buford Timbersnake, uhhh, TimberLAKE, bails her out of jail, Abigail goes on her own sleuthing adventure to uncover the true identity of the evil ivory trafficker. Poison Ivory is a whirlwind of random, off-the-wall humor and misadventures so much to the point of being too zany and wacky for even me to finish. I regret to sadly admit that this is officially the last Den of Antiquity novel I will ever read. I've been faithful to Tamar Myers since I began this series because it started off being fun, cute, and containing many witticisms that southerners can appreciate! I had similar negative feelings toward book fourteen of the series called Death of a Rug Lord, which was also quirky to the point of near ridiculousness. My review for it can be found here: Review for Death of a Rug Lord. 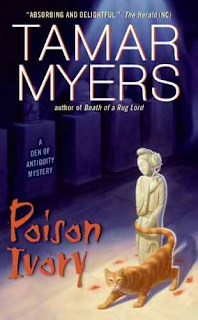 Upon finishing and being disappointed with Death of a Rug Lord , I chalked it up to the fact that not all series books can be winners; perhaps Tamar Myers was just having an off-moment. However, since the pattern continues with Poison Ivory , I'm just not sure what's going on in the head of Tamar Myers and must take a permanent break from the series. The book's euphemisms are consistent with the previous Den of Antiquity installments, but even C.J. 's out-done ramblings are becoming tiring. Perhaps I would have stuck with the series had Tamar Myers redirected her focus on further character development and mystery components. I'm genuinely sad that I can no longer enjoy the Den of Antiquity series. While writing this review, I stumbled upon Tamar Myers' full bibliography, which I see now includes two books in a new series featuring a new character, Amanda Brown! The first book is The Witch Doctor's Wife (2009) and the second is The Headhunter's Daughter (2010). According to the synopses, the novels take place in Congo-Africa and looks to follow Tamar Myers' missionary background. Still remaining a devoted Myers fan despite the direction the Den of Antiquity series is taking, I have put these novels on my wish list. I'm truly excited to read them and hope they're an improvement over the latter!